The technique of fm synthesis (frequency modulation)) has some advantages over additive synthesis in creating complex harmonic spectra with few operators. 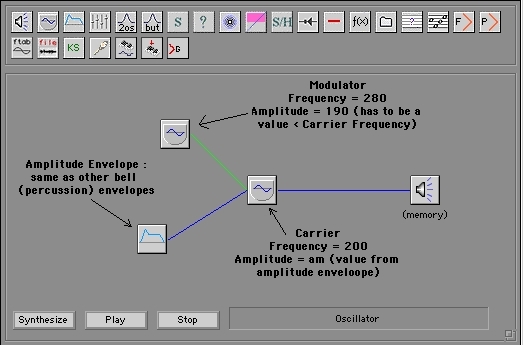 Using the technique described in the tutorial, Creating a Simple Bell, you had to use a minimum of 10 operators to program a BELL sound: fundamental frequency (1 operator), 8 separate partials (8 operators) and an amplitude envelope (1 operator). 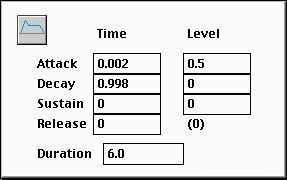 Using FM techniques you can achieve approximately the same effect using only 4 operators. If you have not already done so, please read the tutorials, Additive Synthesis, Creating a Simple Bell, and Fm Synthesis.